NOTE: This is an abandoned project and included here only for historical reasons. I had lots of plans for AlgoScore2, which would be based on SuperCollider for sound synthesis (in real-time) instead of CSound, and probably written in SuperCollider itself. Then many years passed, and the original GNA.org project page has been lost, but I’m still hoping I’ll restart this project some day! 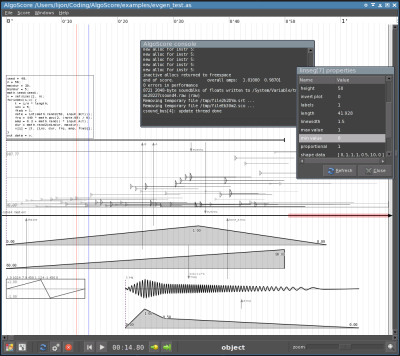 AlgoScore is a graphical environment for algorithmic composition, where music is constructed directly in an interactive graphical score. The result is output as audio (through CSound), arbitrary control data (through JACK ports) for control of other applications, MIDI through JACK or to file, or OpenSoundControl messages. The generated audio can be played back through JACK or exported to an audiofile. Graphical objects are placed in a timeline and connected together. Some objects are fully dependent on user data, while some are generative and reacts on input from other objects. 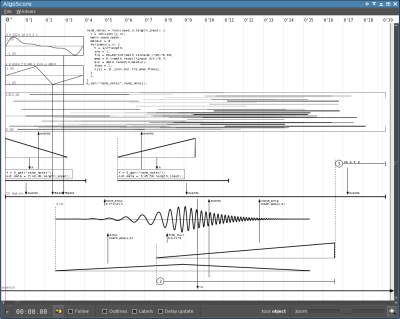 AlgoScore has a non-realtime perspective, where the composer can relate freely to time and construct the composition outside of time. This also means that an object has the ability to access all data of another object in a single moment, instead of being limited to the streaming data of a current “now”. It is highly customizable and extendible with the Nasal scripting language. It’s easy to make your own classes, and also to use nasal code directly in the score for generating or transforming events or control data. Since the composer works directly with the score, there’s no need for an additional step of creating a graphical score of the piece. The score can be exported to PDF or SVG. Examples of scores exported as PDF can be downloaded at the Works page.